We have analyzed genetic variation among populations in the region around the Ural montains and the Volga river, seeking to clarify the population history of the area. In total over 150 samples from Mari, Moksha, Erza and Mansi populations were genotyped for 18 Y-chromosomal biallelic polymorphisms and 8 microsatellite loci, and for 18 polymorphisms from the coding area of mtDNA in addition to sequencing of the hypervariable region 1. Our novel data from northeastern Europe and northwestern Siberia shows that the populations from the Volga-Ural area are a result of a complex set of population processes, including genetic drift and gene flow from various sources at different time frames. The distribution of mtDNA haplogroups traditionally classified into European and Asian overlaps in Western Siberia (Derbeneva et al. 2002), but not in Eastern Europe. The distribution of mtDNA haplogroups (HGs) among Mari, Erza and Moksha (N=89) on the western side of the Urals resembles closely west European, with only 3.3% of Asian haplogroups. Furthermore, the distribution of recently characterised subhaplogroups of HGs H and U in the Volga-Ural area will be discussed. 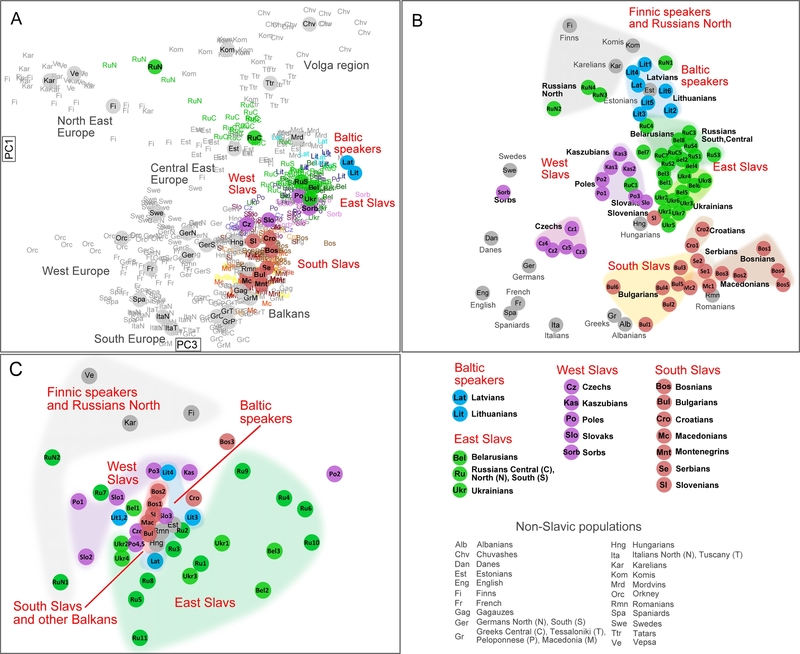 Paternally, the populations differed greatly from each other, which is demonstrated by 47.30% of genetic variation attributed to differences among populations, according to AMOVA analysis of haplogroup frequencies. However, the populations had a rather average degree of variation with haplotype diversities around 0.7 with the exception of the Moksha, whose Y-chromosomal diversity was very low (0.209). Y-chromosomal haplogroup N3 that is characteristic for the whole Northern Eurasia is common in the Volga-Ural region, with frequencies varying from 5% to over 50%. Its sister group, N2, has a more local distribution around the Urals, and seems to reach somewhat higher frequencies in the eastern side of the mountains (Karafet et al. 2002), than in the studied populations from Northeastern Europe. The distributions of some minor Y-chromosomal haplogroups are intriguing. R1b, I1a and J - common haplogroups in Western, Northern and Eastern Europe, respectively - reach relatively high frequencies among the studied populations. This may refer to late gene flow from Europe or Central Asia, in addition to admixture with Russians. Analysis of Y chromosomal microsatellites is employed to assess the source and significance of different haplogroups found in the study sample. Добротный и в целом адекватный анализ по переписи 2010 года. Балтские народы — латыши и литовцы — обнаруживают генетическую близость к эстонцам, говорящим на языке финно-угорской группы, и к некоторым восточным славянам (белорусам). Оказалось также, что балтские популяции близки к волжской группе финно-угорских народов (особенно к мокше и эрзя). Авторы уточняют, что это может отражать исторические события – в древности ареал балто-язычных популяций простирался далеко на восток и почти доходил до нынешнего ареала мокши и эрзя. Авторы как всегда поскромничали, мокша и эрзя близки не только к балтским народам, но и к белорусам, эстонцам, центральным и южным русским. Our SUGRIGE project aims at getting a whole-genome picture of ancient and contemporary Finns and Finno-Ugrians. The main questions include: When did the Finno-Ugric people arrive in Finland, North-Western Russia, and Baltic region? Which archeological culture(s) were they related to? Who lived in the area before they arrived? Did the Uralic language family arrive with the genes? For these aims, we sequence ancient human remains from the regions where Finno-Ugrians live or used to live, in collaboration with University of Tübingen in Germany. The genomes are compared in a population genetic framework with each other and with present-day Finns, Estonians, Karelians, Mari, Mordva, etc. In Finland, the remains are usually not older than 1,000 years, due to acidic soils, and therefore the Finnish part of the project focuses on the time interval from the Iron Age to 1800s. To trace the genomes further back in time, the aim is to collect and analyse samples from the areas previously or currently inhabited by Finno-Ugric peoples. In practice this means obtaining samples from archaeological contexts dating to all periods of prehistory: to the Mesolithic and Neolithic Stone Age, to the Bronze Age and up to the Iron Age and medieval period. The area of our interest covers the forest and forest steppe areas of European Russia and western Siberia, but also samples from other neighbouring areas and from adjacent archaeological cultures will be used as references and for studying the contacts and development of different populations. Currently, we have analysed DNA from five archeological sites in Finland, yielding 48 individuals. The time scale is from the Iron Age to the 1800s. First publications are planned by the end of 2016.
встречаемости которых 53,3% и 23,7% соответственно.